HANNIBAL, Ohio – The tattered sign standing at the entrance of Ormet’s North Gate pretty much says it all. It pleads to Gov. 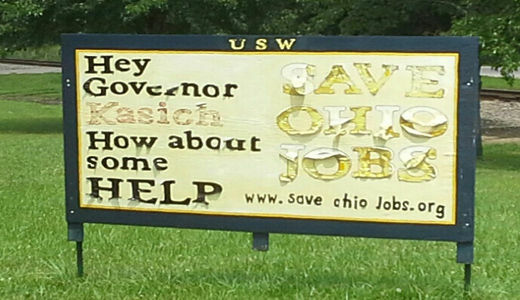 John Kasich, R-Ohio, for “some help” to save Ohio jobs. We reported earlier this month (Aug. 5) that on July 31, Niagara World Wide fired the last twenty workers, formerly employed by Ormet Primary Aluminum Corporation. With those firings, Niagara also announced that the facility in Hannibal, Ohio, would close for good. Two questions must have been on many minds that day: How did this happen? And what can anyone do about it? The first question is perhaps easier to answer because the events leading to Ormet’s final doom had been a long time coming. The aluminum industry as a whole was faced for some years with falling prices on the world market. That factor, coupled with American Electric Power’s (AEP) price of $16 million per month to operate, may have eventually doomed the Hannibal plant anyway. We don’t know that for certain because there was a proposal in the works to bridge the electrical power usage with a less expensive gasification process. In order for that promising solution to be put in place, the Hannibal plant needed time, and that could only happen with relief from AEP and/or a mandate from the Public Utilities Commission (PUCO). To gain that additional time and a price-relief from AEP, Ohio’s leading government officials, particularly Gov. Kasich, needed to intervene and put pressure on AEP and PUCO, stressing Ormet’s importance to the state’s economy. The workers and their union believed this might happen because the previous governor, Ted Strickland, a Democrat, was able to accomplish just that. He brought the parties together and worked out the deal that did indeed save the Hannibal plant. This time, however, the political conditions were different. Ohio’s present governor, John Kasich, ignored the looming crisis – the man famous for his attempt to bust Ohio’s public employee unions, with help from the now Republican- dominated legislature. Throughout Ormet’s final agony, Gov. Kasich, along with Rep. Bill Johnson, Republican from Ohio’s 6th Congressional District, and U.S. Senator from Ohio Rob Portman, R, failed to do anything to save Ormet. They were all noticeably absent throughout the sinking of Ormet and her jobs. The labor movement has selected seven states where it says workers have a high interest in the outcome of the gubernatorial elections this fall. Ohio is one of the states in which unions are putting on a major effort to defeat an incumbent GOP governor. 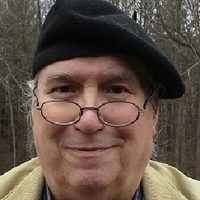 Tom Byers (President, LU 5427, USWA) reported that not every politician deserted the Ormet workers. State Senator Lou Gentile and State Representative Jack Cera, both Democrats, worked diligently with the union to save Ormet-even U.S. Senator Sherrod Brown, D, did all he could. But to no avail. Without intervention by Gov. Kasich or Rep. Johnson, whatever pressure that could be applied to AEP or PUCO was simply too little. Even the petition bearing over 1,000 signatures failed to move either Gov. Kasich or PUCO to action. As reported previously, Kasich offhandedly took the position that the proposed plan wouldn’t work, and proceeded to ignore repeated pleas to even meet with the union or visit the Ormet site. Kasich’s contempt for Ohio’s workers and for the welfare of its communities has never been so obvious as in Ormet’s closure. What can the Ormet workers and their community do about it now? When the shock wears off, the obvious first step for them and for all workers in Ohio’s 6th Congressional District is to work on defeating Kasich, Johnson, Portman, and the GOP ticket in November. Many union members will be doing just that through the Ohio AFL-CIO and the Monroe County Democratic Party. The wise organizer V. I. Lenin once said, “It is at moments of need that one learns who one’s friends are.” If we in eastern Ohio didn’t know who our friends were before, we know now and we will remember in November!